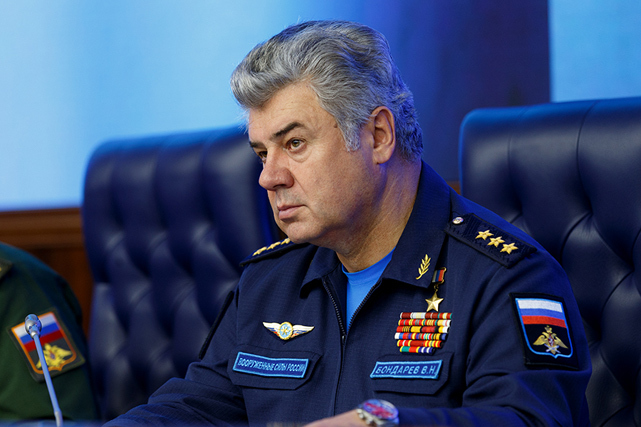 All bombs and missiles launched by the planes of the Russian Aerospace Forces targeting facilities of the terrorist Islamic State in Syria have hit their targets, Chief Commander of the Russian Aerospace Forces Col. Gen. Viktor Bondarev said. "Aircrews demonstrated high proficiency during this period of time (from September 30 to October 7), all bombs and missiles hit their targets with no mistakes," Bondarev told a briefing on Oct. 7. Each flight is preceded by a thorough training of the aircrew. "We study recorders data, data collected with unmanned aerial vehicles, and space intelligence footage," Bondarev said. Referring to high efficiency of the use of the aircraft of the Russian aerospace forces in hitting targets of the 'Islamic States' in Syria, Bondarev revealed that "on October 4 only, one formation of two Su-24 airships stroke a 32-vehicule mechanized column of the IS terrorist in the area of the Aleppo airdrome, destroying almost all armored and other military equipment on which terrorists mount their antiaircraft artillery weapons." "Every flight is analyzed thoroughly and we confirm this work done by our pilots, using data collected with the unmanned aerial vehicles and photo cameras installed on the aircraft, as well as intelligence collected by agents," Bondarev said. "For all this time, no civilian property in Syria has been damaged [as a result of the strikes carried out by the Russian air forces]," he said. Read more: Is Moscow planning ground operations in Syria?